Brief animation over Ban-Fu's head when the player summons the Ban-lu, Grandmaster's Companion mount. This pet is only available to Monks, however any class can summon it once it has been added to your collection. Rakes the enemy with jade claws, dealing 413 Magic damage. I am thrilled to report that YES, this pet is still available in Battle for Azeroth! I just got mine. (For people reading this down the road, BfA went live about 3.5 weeks ago.) I still had to do the order hall campaign, the Breaching the Tomb achievement/questline, & the mount quests. After receiving the mount, I went straight to the vendor & bought the pet immediately! Now on to my Death Knight to level her up & get those pets! Is this still available as of patch 8.0 and after BFA release soon, please? Total play time, Level 1 monk to a Level 25 Cub of Ban-Lu: 2 Days, 9 hours, 14 minutes, 22 seconds. A lot of effort went into this one. It is now one my most prized pet. Just got this today - working on the Druid, Shammy, DK & Druid pets next. It's hard work but is definitely a great look for the pain. Most of the other class pets aren't as unique and likely to stand out, IMO. Just reached Concordance on my monk tonight and picked up this pet. 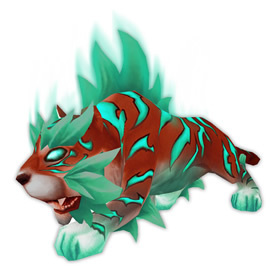 When you have her out and mount up on Ban-Lu, Ban-Fu will have an animation above her that matches the now removed monk buff, Legacy of the White Tiger. She will also run over to other monks who mount up on Ban-Lu. The only other activity I've noticed is that when idle for a bit she'll lay down and take a nap. She will not sit on your lap when you /sit with her targetted like most other cat pets do. Why do only some of the classes get pets/toys? This doesn't seem fair. My main is hunter so I get nada. No toy, No pet. I don't have time to do all this nonsense on an alt, wish the pet were at least tradable. Wow, this is a chore! I have a monk, but at 100, he has a way to go to get this. Anyone get it yet? Think Blizz will relax these requirements someday? Introducing the youngest member of the Xuen Dynasty! Daughter of Ban-Lu. Niece of Xu-Fu. Granddaughter of the celestial Xuen... It's Ban-Fu!